This afternoon Hillary Clinton spoke to the Global AIDS Conference at Saddleback Community church in Orange County. The audience of about 1,000 people from across the USA and 18 other nations greeted her very warmly (with a standing ovation). In fact, the greeting was much warmer than I had personally expected. Rick and Kay Warren had invited ALL of the Republican and Democratic candidates for president to come to the conference. ONLY Hillary responded by appearing live. John Edwards, Barak O'Bama, John McCain, Mike Hukabee and Mitt Romney appeared via video. Hillary was articulate and at times, passionate. She delineated a very clear plan about how she would deal with HIV/AIDS both in the USA and around the world. She obviously knew her audience, quoted Scripture with familiarity and impressed me and several of my friends who are not friends of Hillary. Being a bit of a cynic, I wonder if she can be trusted. 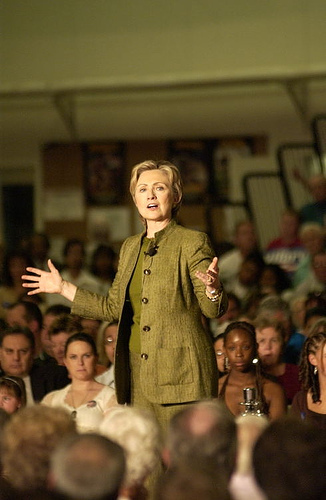 Hillary has reinvented herself several times over the years, and it makes me wonder if she just communicated what we wanted to hear (Bill was very good at that). BUT, if she really believes what she said, then I am on her side. It was rather interesting to see what kind of background the candidates chose to make their video comments. Mitt Romney was dressed in a very expensive suit, sitting on a bench with an expensive painting in the background. He looked like an old style, highly sophisticated, aristocrat. Barak O'Bama had a background covered with his website address. His face filled the entire screen -- you could almost count his nose hairs. Mike Hukabee was video taped in what appeared to be his campaign office. People were moving around in the background. Came across like a nice, ordinary guy. He and Rick Warren went to seminary together, and Mike told us the best move Rick ever made was marrying Kay. He seemed like a genuinely nice guy. I think that the candidates who didn't show up (that's all of them but Hillary) probably made a tactical error if they wanted to get a bit more of the evangelical vote. Lots of evangelical leaders at this conference -- would have been a good place to get support. Other than this bit of excitement, the conference has been good -- just too many talking-heads, and not enough time to network or interact with others involved in the battle against HIV/AIDS. Personally, it's been a good conference for me. God has been speaking to me about a number of things and is confirming some of what I have thought about in my heart - but more of that later. At Saddleback Church service last sunday, they had the two AIDS activists to give a testimony on how God change their lives. It was Christopher Yuan and David Miller. Their testimonies were really moving and powerful. They really do raise awareness on what it's like to live with HIV and what we can do to help. They sure opened my eyes. I'm all for addressing AIDS as a high priority for the body of Christ, and I'm delighted to hear that Hillary Clinton has a plan to do so. But are any of the evangelicals who cheered for her bothered by the fact that she has been a lifelong, all-out advocate for the holocaust of abortion on demand? If Hitler showed up and pledged to fight AIDS would he get big applause from these evangelicals? I'm not saying Hillary is Hitler, I'm just wondering if there is any point at which evangelicals look at someone and say - "Your support for dismembering defenseless children makes it really hard for me to clap for you." Karl, I stumbled across your blog and the picture of you grinning and holding a monkey. Oh, my goodness. It's been too many years since I've been in contact with you and Debbie. Can you guys email me or something so we can catch up?